Bakst could not and did not want to accept such a state of affairs, but he was not a natural-born revolutionary, fighter or rebel either. He did not dismiss the legacy of the past — quite the opposite, he fully immersed himself in it, seeking that which could make ordinary people alert to the beauty of life. Sergei Diaghilev’s Ballets Russes became a venue where the artist could apply his talent, showcase his discoveries, and create an inimitable and spellbinding world of fairy tales. Design for the sets of ballets such as “Cleopatra” (1909, Theatre du Chatelet) and “Scheherazade” (1910, Grand Opera) won for Bakst worldwide fame and literally turned his life upside down. 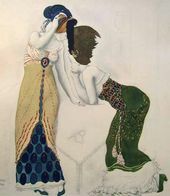 Paris started dreaming of the Orient, so unusual and surprising, spicy and passionate, dazzling and elegant — and it was Bakst’s sets and costumes that created such images in the minds of Parisians. The exotic Orient quickly became fashionable: society belles were anxious for a change in their apparel, and many of them approached Bakst directly with requests to create exclusive clothes for them. The fashion house owners in Paris, too, started to think that the man who could captivate the public with Oriental motifs would probably be equally good at designing fashion collections. Thus, unexpectedly for him, Bakst came across an opportunity to become a fashionable and highly-paid clothes and accessories designer. Although the artist thought carefully before becoming engaged with the world of high fashion, his ethical qualms were brushed away quite quickly. In the summer of 1910 Bakst wrote to his wife: “Have you heard about Poiret the dressmaker? C’est le dernier cri [French: He is all the rage now]. Recently he offered me 12,000 francs for 12 drawings of fashionable outfits. Artists advise me against linking my name to his, they are concerned I would become ‘declasse’. But what a sight it would be if in two years (there is no way it can happen earlier) the public in St. Petersburg will wear my apparel!” Bakst had a huge field of action stretching out ahead of him. There was a chance to at least partly fulfill the dreams of his youth — to make the exterior of life aesthetically harmonious. In his article “Costume of a woman of the future” the artist wrote: “Architecture, mostly in Germany, in its eagerness to introduce something new to its art secures the assistance of sculpture and painting in order to create a unity between the style and the impression it produces. So it would be quite logical if, for the sake of overall harmony, men or women who are to live in such a home would dress up to match their environment. Is it not the visual artist’s mission to express the ideas of his age in a costume? This is the essence of what I am trying to do.” This pivotal principle became a cornerstone of the artist’s ensuing attempts to create a style of life where dresses, headwear, wigs, footwear, fabrics, accessories and even perfumes would agree with their settings. In 1903-1904 Bakst was enthusiastically creating costumes for his wife, one of which is held by the Tretyakov Gallery. In the early 1910s the artist for the first time took up fashion design seriously, his female clients including a number of most distinguished personalities: Grand Duchess Yelena Vladimirovna (granddaughter of Alexander II), the French actress Eva Lavalliere, the Russian aristocrats Fekla Orlova-Davydova, the lovely-looking sisters Ydena Oliv and Duchess Natalya Gorchakova. 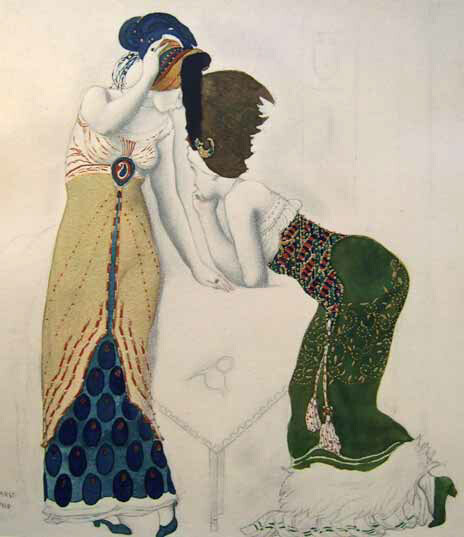 Usually they commissioned garments to Bakst’s design at the most prestigious fashion houses in Paris (at Poiret and at Worth). The artist created especially extravagant and showy costumes for two truly wonderful women, Ida Rubinstein and Luisa Casati. They both were marked by their unconventional beauty, outlandish ideas and tremendous wealth. For Rubinstein, his life-long friend, the artist created, to great acclaim, costumes of Salome, Cleopatra, Pisanella and others (for stage productions), as well as numerous garments for everyday use. 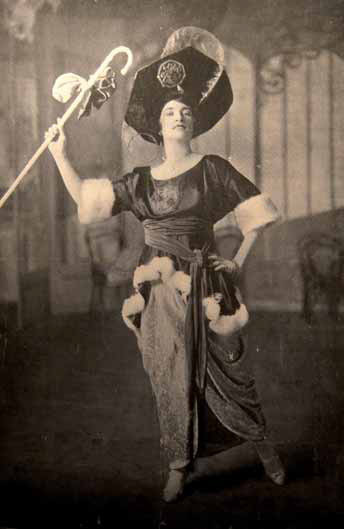 For Marchioness Casati, Bakst designed unique costumes for balls and society receptions as well as exclusive attire for daily use. In 1913 Bakst designed for her costumes of a white harlequin, animal tamer, goddess of the Sun, an Indo-Persian outfit and other clothes. Casati’s Indo-Persian costume included several pale blue gold-threaded full-body veils, a cone-shaped headpiece adorned with pearls, Oriental shoes with upturned toes, and golden claw-shaped finger caps. Ultimately this outfit somewhat differed from Bakst’s initial drawing called “Indo-Persian dance”. Interestingly, the marchioness never danced; rather, she was fond of striking static poses that afforded an ample view of her adorable figure. Luisa Casati also employed Bakst as a designer for entire ball receptions. Many of the artist’s ideas were realized by his spendthrift client at a Pietro Longhi grand ball in the 18 th-century style, which took place in September 1913 in Venice on St. Mark’s Square. 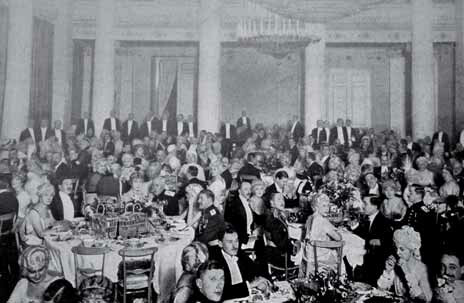 200 black servitors, dressed up to Bakst’s design in white wigs and red velvet camisoles embroidered with pearls, and holding candelabra, were arrayed across the square beside the laid tables. In charge of the overall design of the ball, the artist also received many commissions for costumes for this event whose list of guests included English, French and Italian aristocrats. In many respects, not only Bakst’s designing talents accounted for this success, but also his attention to detail, as well as careful stylization and execution. This allowed him to avoid vulgarity in the Oriental costumes without sacrificing their dazzle, while choosing among different fabrics was especially important. The artist himself once wrote to the director of the Grand Opera in Paris Jacques Rouche about the necessity of using good fabrics: “I am a couturier too, who, whenever possible, chooses quality fabrics himself (always himself)”. Surviving letters from French fashion houses show that Bakst personally chose textiles for Ida Rubinstein, Alice Garrett and others. 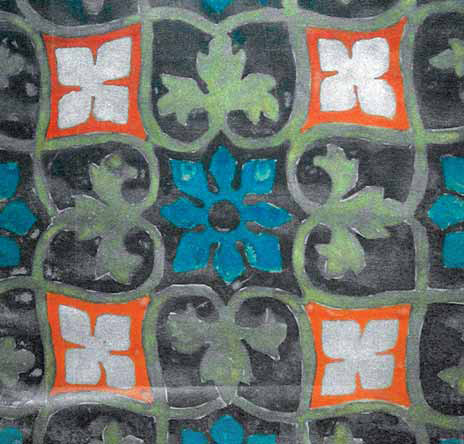 As such, fabric design became possible largely as a result of the introduction of mass production of print cloths. During his first visit to the US (from Autumn 1922 to Spring 1923) Bakst met the textile tycoon Arthur Selig, America’s silk king. 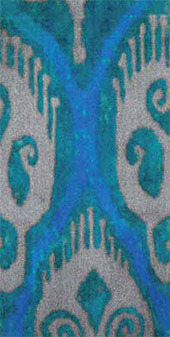 Selig commissioned from the artist a series of drawings on American Indian themes, to be used on silks; probably a Russian folk design was suggested by Bakst. 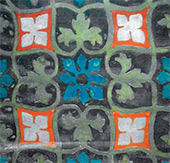 It was required that the patterns be simple, for the manufacturing of prints was a mass production process. Although they were very popular and a huge success, Bakst’s textile designs are little known, especially in Russia. 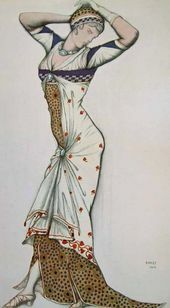 Six months before his death Bakst wrote to his niece Marussia Klyachko: “.My textiles are in the greatest demand across America — all society ladies now sport them.” Some of the sketches are kept at the Garrett family collection in Evergreen House in Baltimore. In March-April 1927 an Art Centre in New York hosted a modest show of Bakst’s “textile drawings”, and in April 1927 a bulletin published there ran black and white photographs of some of them. In 1929 an article by Katherine Gibson about Bakst’s work in textile design, illustrated with the American Indian patterns, came out in the American magazine “Design”. Regrettably, the current location of most drawings is unknown (except those now held in Paris and Baltimore). The artist made quite a lot of hat drawings for the famous Parisian fashion houses Jeanne Paquin and Camille Roger. 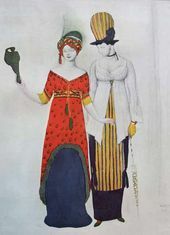 The magazine “Comedie de la mode” devoted a whole page spread to the collaboration between Bakst and Roger, with detailed descriptions and photographs of the hats. Bakst’s heirs still keep his album with sketches of headpieces, which show the diversity of the artist’s style in this field. Contemporaries praised Bakst’s masterpieces not only for their elegance and comfort, but also for their novelty and singularity. 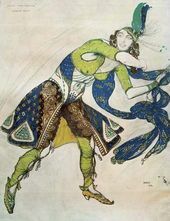 The “Daily Mail” newspaper wrote on December 1 1913: “Bakst in his works combined the Russians’ love for barbarian colour effects with the refinement of Aubrey Beardsley’s line...” The singular discoveries in fashion were not all focused on the Oriental themes originating from the popularity of the productions of “Cleopatra” and “Scheherezade” — Bakst succeeded in introducing Russian motifs into Parisian and international fashion. This applies not only to dresses but to fabrics, headgear, and footwear as well. Living abroad, Bakst started drawing on the Russian historical experience unknown in the West: fur hats styled after boyar’s hats, overcoats resembling the drayman’s sheepskin, folk ornaments and needlework. Gras Forster wrote in his article “Will Bakst dominate the fashions for 1916?”: “Russian ideas start to penetrate fashion. Russian blouses have been accepted. Next came fur trims in Russian style — after Bakst’s sketches — followed by high boots, fur turbans and a realistic emulation of Russian headpieces.” For Paris fur was a luxury, not an indispensable warmer as it was for Russians. However, in this area Bakst’s ideas met with recognition too. “Dresses will be copiously trimmed with furs. I’ve come up with droll hats, in the mold of Catherine II, the public took to it right away. Paquin too asked to design items with fur for her.” Surviving letters show that the artist negotiated with representatives of fur firms. The artist also worked with a famed producer of fancy shoes “Hellstern and Sons”. Bakst designed for them a wide variety of shoes: from Greek sandals to Cossack-style high boots. Richelieu-style glazed-kid cherry shoes designed by Bakst also enjoyed success. He designed thick-soled shoes for Maria Kuznetsova as Potiphar’s wife in the ballet “The Legend of St. Joseph”. The artist was also famous for trimming ladies’ shoe heels with precious stones. Not only did Bakst make clothing, head-dress and footwear designs, he also sought to popularize a new life style. In 1923-1924 the artist gave a few lectures in the United States and Canada on fashion, costume, and new trends in clothing style. 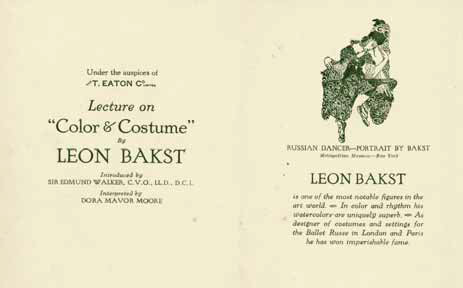 The lectures were a great success and helped to promote Bakst’s ideas in American fashion. P.S. On the American continent there is still an enviable continuity in perception of fashion design as a form of art. In spring and summer 2010 the Metropolitan Museum of Art and the Brooklyn Museum Costume Collection are going to hold jointly two exhibitions — “American High Style: Fashioning a National Collection” and “American Woman: Fashioning a National Identity”. They will feature the art of American fashion designers of the mid 19th-late 20th centuries, as well as the works of French fashion houses of Worth and Paquin for which Bakst created his designs. Even a hundred years later the artist’s creative ideas have not lost their appeal. Bakst, Léon. “On the art of today". Stolitsa i usadba [Town and country]. 1914, No. 8, p. 18. 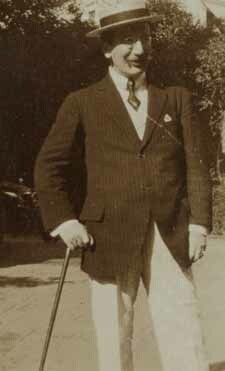 Paul Poiret (1879-1944) - famous French fashion designer and couturier, reformer of fashion; opened a fashion house in Paris in 1903. Tretyakov Gallery Manuscript Department, Fund 111, item 355, sheet 1 (reverse). Bakst, Léon. “Costume of a woman of the future". Birzhevye vedomosti [Stock Exchange News], 1913, March 20. Tretyakov Gallery Manuscript Department, Fund 111, item 2337, sheet 11. Tretyakov Gallery Manuscript Department, Fund 111, item 39, sheet 2 (reverse). Yelena Vladimirovna (1882-1957) - a grand duchess, daughter of Grand Duke Vladimir Alexandrovich (in the 1890s Bakst taught painting to the duke's children, including Yelena); Eva Lavalliere (Eugenie Marie Fenoglio) (1876-1929) - a French actress; Fekla Orlova-Davydova - a countess, nee Baroness Staal, wife of a member of the State Duma Alexei Orlov-Davydov; Yelena Oliv (1879- ? ), and Natalya Pavlovna Gorchakova (1880-?) - daughters of a wealthy sugar producer, patron and connoisseur of arts Pavel Ivanovich Kharitonenko. The fashion business “House of Worth" was founded by Charles Worth (1825-1895) in Paris in 1858. In 1945 Worth merged with the fashion house of Jeanne Paquin. Ida Rubinstein (1883-1960) - actress and dancer. Orphaned early in life, she inherited a big fortune; she decided to devote herself to art, performed in Diaghilev's Ballets Russes, and later set up her own company. 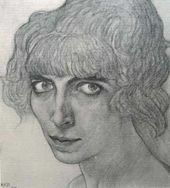 Luisa Casati (nee Amman) (1881-1957) - a marchioness famed for her astonishing beauty and extravagance, a muse of poets and painters, and a patroness of arts. Maria Kleinmichel (18461931) - a countess, daughter of Senator Eduard von Keller, the hostess of a fashionable society salon in St. Petersburg. Peterburgskaya gazeta (Petersburg newspaper), 1914, January 25. Yelizaveta Shuvalova, nee Baryatinskaya (1855-1938) - the hostess of a fashionable society salon in St. Petersburg famous for her balls and philanthropy, and a member of the Society for Protection and Preservation of Art and History Landmarks in Russia. Utro Rossii [Russia's morning], 1914, February 11. Bibliotheque Nationale de France, Bibliotheque-Musee de l'Opera National de Paris. Fonds Rouche. Th. des Arts. R. 8 (4). Tretyakov Gallery Manuscript Department, Fund 111, items 2140-2142, 2145. Russian Culture Fund, Archival Library, Nikolai Grishkovsky's fund. Manuscript Department, State Tretyakov Gallery, Fund 111, item 1047, sheet 4 (reverse). Manuscript Department, State Tretyakov Gallery, Fund 111, item 1934,sheet 1. Russian Culture Fund, Archival Library, Grishkovsky's fund. Tretyakov Gallery Department of Manuscripts, Fund 111, items 1935-1939. Tretyakov Gallery Manuscript Department, Fund 111, item 2644, sheet 2. Gibson K. Textile Designs by Léon Bakst // Design, Syracuse (New York), 1929. Vol. 31, pp. 109-113. The Constantinowitz family collection, Paris. Birzhevye vedomosti [Stock Exchange News]. 1914, January 20. The fashion house of Jeanne Paquin, one of the first French female designers of clothes, operated until 1954, at the address Rue de la Paix, 21. “Maison Hellstem & Sons" (founded in Paris in the 1870s, located near Place Vendome) was one of the first fashion houses to specialize exclusively in footwear. It had its best years in the 1920s. Manuscript Department, State Tretyakov Gallery, Fund 111, item 435, sheet 1 (reverse). Comedie de la Mode. 1913, April 20. Daily Mail. 1913, December 1. Tretyakov Gallery Manuscript Department, Fund 111, items 373, sheet 1. Kuznetsova Maria (1880-1966) - opera singer (soprano) and dancer. Daughter of the artist Nikolai Kuznetsov. In 1922 she set up in Paris her own theatrical enterprise (in collaboration with Léon Bakst).